When I first started painting on vintage plates it occurred to me that it was very much like tattooing. I love the way that you have to adjust your image to the contours of the plate and either work with or hide little flaws. I always try to incorporate the original plate design into my illustration by hiding or revealing certain parts. I get really excited when a design is finished and it is hard to tell what image was on there first! One of my first series of illustrations was in homage to the old school tattoo designs I just love. Anchors and daggers, hearts and swallows I really love the nostalgic imagery and I think they suit the vintage plates so well. Of course I had to include knuckle tattoos as I have always been so intrigued with the variations of four letter words that some people come up with. 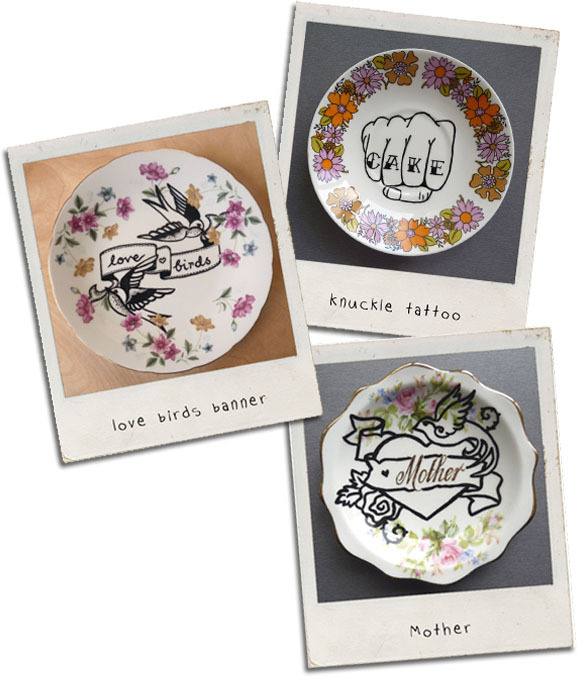 My tattooed plates have proven really popular and sell very well. 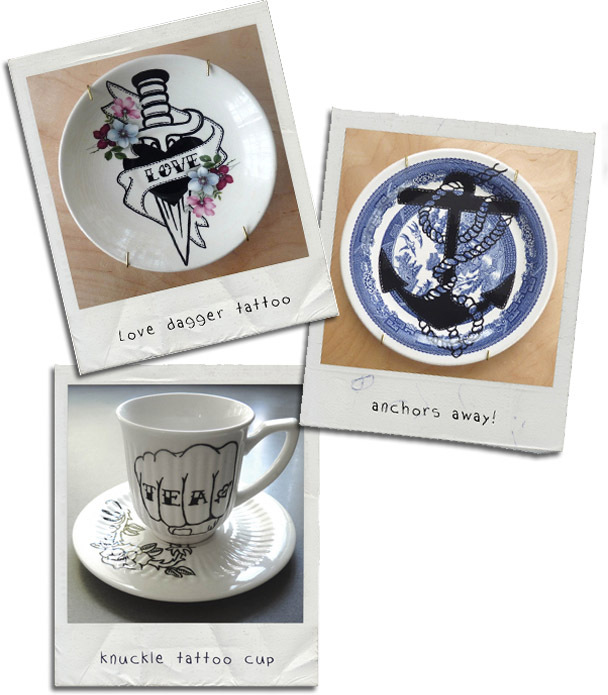 I have also been lucky enough to have had some awesome commissions, where I have reproduced the tattoos of my clients on to vintage plates and even teacups! How cool would it be to have a copy of your tattoo hanging on the wall or even using it to serve up a piece of cake to your guests! I still have a couple of sketchbook pages of tattoo designs to complete - so watch this space & do let me know if you have any ideas you would like to see as well.